The arts & crafts show is this weekend and I'm pretty excited. I've been working all week to finish stuff up, get it priced, and figure out my display. This is the fourth time I've participated in show over the last few years. I'm mainly selling the knit items and collages I've posted pictures of here, but wanted to show you a few more things I'll be offering from my Ravelry account (user name: goldenbird). I've enjoyed the process of preparing for this show more than any of the others, in part because I know what to expect this time around which makes it less scary. But it's also been enjoyable because most of the items I'm offering weren't made with the intention of selling them; they were made for fun or as samples for a knitting class I used to teach. I enjoy creating for the pure pleasure of it so much more than making things solely for sale. So it feels good to offer up my stash of goodies that I've worked on over the last year. I do hope you have a wonderful time at the fair. 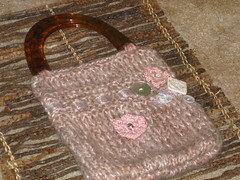 Your bags with their buttons and flowers are so pretty and the soap bag with the little silver heart is adorable. 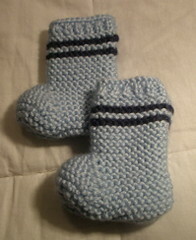 That's the first time I've seen ballet slipper baby booties, they are so cute! Hi there, I love your blog and I hope you dont mind but I've added it to my blogroll on my site.